These ‘Terms and Conditions’ apply regardless of whatever user device you are using, including desktop, laptop or mobile web browser, digital television, mobile phones, automobile-based personal computers, handheld digital devices, and any other technology. Please read through these ‘Terms and Conditions’. If you do not agree with these ‘Terms and Conditions’, do not use this website. If you do use this website, your conduct indicates that you agree to be bound by these ‘Terms and Conditions’. Unless otherwise specified the contents of all the pages in this website are owned or licensed to BATRIBIKE Limited. The contents of this website may be used for personal non-commercial use only. You may only download and print extracts of the content for your own personal non-commercial use. (b) reproduce, republish, modify, archive, distribute, store, archive or commercially exploit the content without prior written consent from BATRIBIKE Limited. (c) which is technically harmful (including, without limitation, computer viruses, logic bombs, Trojan horses, worms, harmful components, corrupted data or other malicious software or harmful data). The content of this website is for information purposes only. BATRIBIKE Limited makes no guarantees as to its accuracy or reliability. Under no circumstances do we accept liability of any description, including liability for negligence (except for personal injury or death), for any damages or losses (including, without limitation, loss of business, revenue, profits, or consequential loss) whatsoever resulting from performance of, use of or inability to use this website. While BATRIBIKE Limited endeavours to ensure that this website is normally available 24 hours a day, BATRIBIKE Limited shall not be liable if for any reason this website is unavailable at any time or for any period. BATRIBIKE Limited makes no warranty that this website (or websites which are linked to this website) are free from computer viruses or any other malicious or impairing computer programs. The pages contained in this website may contain technical inaccuracies and typographical errors. The information in these pages will be regularly updated but may at times be out of date. We accept no responsibility for keeping the information in these pages up to date or liability for any failure to do so. This website contains hypertext links to third party websites. BATRIBIKE Limited will have no responsibility for, nor endorse in any way such third party websites or their content. If you decide to access any of the third party websites linked to the site, you do so entirely at your own risk. If any term, condition, or provision of these ‘Terms and Conditions’ is determined to be unlawful, invalid, void, or for any reason unenforceable, the validity and enforceability of the remaining terms, conditions and provisions shall not in any way be affected or impaired thereby. Use of this website and these ‘Terms and Conditions’ shall be subject only to the laws of England and Wales, which shall exclusively govern the interpretation, application and effect of all the above permissions, exclusions, licences and conditions of use. 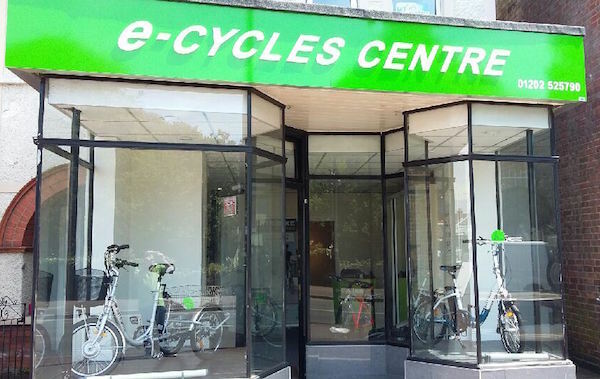 The e-Cycles Centre in Bournemouth is a specialist stockist of Batribike electric bikes. Colm will be happy to arrange a test ride for you.